Every Wednesday: Learning Together Toddler at Market Rasen Children’s Centre, 11am - noon. Together Baby at Market Rasen Children’s Centre, 1.30pm - 2.30pm. French bingo at Caistor Arts and Heritage Centre, 6pm - 7pm. Market Rasen Youth Club in the Festival Hall, 6pm - 7.30pm. Age 8+. Live theatre: The Window at Caistor Town Hall, 7.30pm. Doors and bar open at 7pm. Advance tickets £9 (£10 on door) from Caistor Post Office or 01472 851075. Noah’s Ark Toddler group, 9.30am - 11am at the Salvation Army Centre, John Street. GDPR free drop-in event at Caistor Arts and Heritage Centre, 9.30am - 11am. 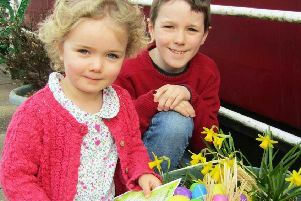 Children’s Easter Holiday Crafts at Caistor Arts and Heritage Centre, 10.30am - noon. Creating Easter decorations and cards. Pilates for Beginners in Newtoft Village Hall, 7.30pm. Chocolate Easter Bingo in North Kelsey Village Hall, 7.30pm. £1. Raffle and refreshments. £1 per person. Thinking session at Hope Tavern Holton le Moor; physics you didn’t learn at school, 7pm. Suggested donation £2. New exhibition at Caistor Arts and Heritage Centre: Maria Garner and Vivian May - Calling to the Moon. Free admission. Easter Bunny week at Elsham Hall Gardens, 11am - 5pm. Until April 6. Details: 01652 688698. Breakfast with the Easter Bunny at Market Rasen Salvation Army Centre, 10am - noon. £3.50 per child (must be supervised) and £2 for adults wanting breakfast. Booking advisable - 01673 842859. Easter egg hunt at Rase Park, noon. Limited tickets available - £5 from the club. Live music: Egypt at The Hope Tavern, Holton le Moor, 4pm. Door charge £8. Wrawby Mill open day, 1pm - 5pm. No charge for admission but donations gratefully received. Details: www.wrawbywindmill.co.uk or 01652 653699. Zumba at Newtoft Village Hall, 6.30pm. West Rasen Heritage Group in the Heritage Centre, 7.30pm. History of the Market Rasen Mail. BASH (Brigg Amateur Social Historians) in Brigg and District Servicemen’s Club, 8pm. Paul Hare - The Bloody Red Baron. Admission free. Details: 01652 657053. Focus Youth Group at Market Rasen Methodist Church, 6.30pm - 8pm . Children’s Easter Holiday Crafts at Caistor Arts and Heritage Centre, 10.30am - noon. Bird feeders and feathers. More details at 01472 851605. Binbrook & District WI in Binbrook Village Hall, 7.15pm. Therapy Dogs nationwide. For more details call 01472 399009. Tudor Tales craft activity session at Market Rasen Library, 10am - noon. Free admission; £1 per craft. Children must be accompanied. Bingo in the Festival Hall. Eyes down 7.30pm. Barnetby Tractor Run & Vintage Day at Railway Yard, Victoria Road, Barnetby. Open 9.30am; run starts 10am. Raffle and refreshments. Proceeds to Lindsey Lodge Hospice. Enquiries to 07841 500454.